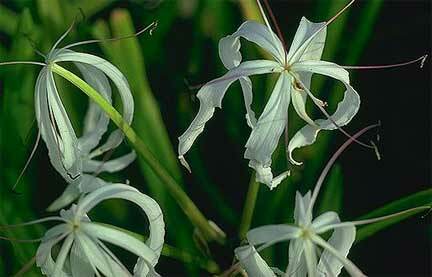 Also known as Swamp Lily or Spider Lily, this is a very versatile and hardy plant. It makes a great feature plant for the home garden and also flowers well in containers. It is used in street planting or around pools where tough and beautiful is necessary. It will form a clump of plants once established. Leaves are long and strappy. From November to March white, fragrant flowers form in a cluster with 10 to 30 flowers sticking up out of the plant. It can be grown in a wide range of conditions from full sun to part shade or more. It tolerates poor drainage and clay soils, and can be planted successfully under established eucalyptus. It is suitable for coastal areas and also tolerates frosts. Although seen growing along river banks it can handle drought.